So this was our second valentine since we got married and I had planned a surprise meal for my husband. But as usual nothing went as planned. Just a day before valentine, there was a snowstorm here in Rocky Hill, Connecticut, so we couldn’t leave the house. I wanted some alone time so that I could prepare everything, but to make things more difficult, my husband was asked to work from home that day. Yes, I was excited to have him all to myself but I wanted my plan to somehow work too. I desperately wanted him out of the house for atleast an hour, but such a lazy bum he is, he refused to budge even after all my excuses. Luckily we ran out of milk and that is an emergency situation in our house as both of us are big Coffee freaks, so finally he had to step out. In a small bowl whisk together olive oil, garlic, lemon juice, cornstarch, red wine vinegar, Italian seasoning, paprika, onion powder, red pepper flakes, salt and pepper. Place the chicken in a rimmed 13-in. x 9-in. baking dish. Place the breasts and spread them out evenly in the pan. Pour olive oil mixture all over chicken, turning pieces to coat all sides. 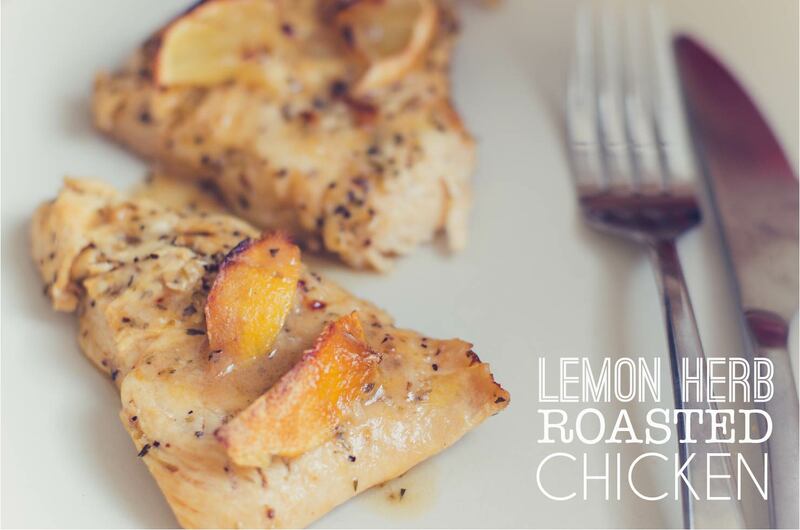 Arrange slices of lemon over the chicken. Sprinkle the freshly chopped thyme and rosemary generously. Bake uncovered for about 30-40 mins or until chicken is cooked. Finally, garnish with additional chopped fresh herbs, if desired. Enjoy! For best results, chicken can be marinated in an air-tight plastic container for a couple of hours or overnight in the olive oil mixture. This entry was posted in baked, FOOD, Recipes and tagged chicken, chicken breasts, herb, lemon, lemon chicken, quick and easy, quick meal, roasted chicken. Bookmark the permalink. Looks …………. Delicious ! Look forward to try it out soon . Thanks mumma..:) Let me know how it turns out..